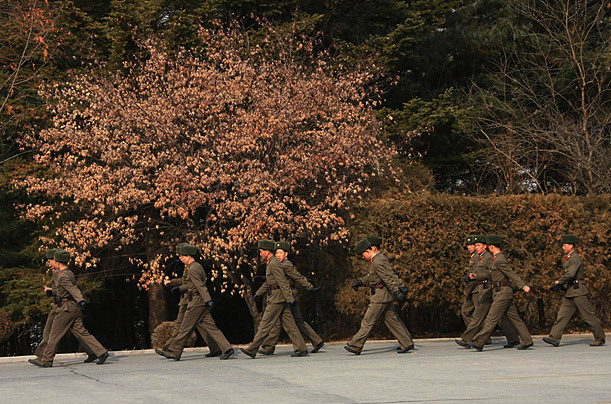 In 2008, Chinese photographer Liu Yuan and his wife embarked on a train journey across North Korea. While riding the rails, Liu photographed out the window of his private compartment. "When a male inspector found my Canon 1Ds NMARK III with it 28-300 mm lens, he raised his eyebrows in surprise and quickly brought several of his comrade inspectors over to see it," Liu writes in Red Land, his book describing the journey. "Fearing it would cause some misunderstanding, I quickly opened the camera screen, showing them the pictures I had taken in Dandong, and allowing them to shoot a few pictures themselves. Upon confirming that this was just a large-sized camera, smiles appeared on their faces."